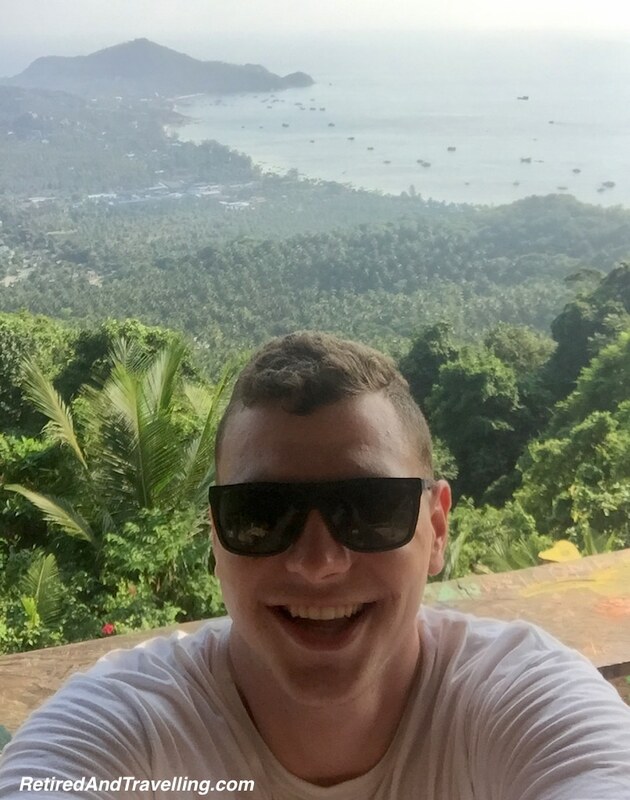 Our son Nick is travelling in SE Asia and has been a great advance travel scout for us. Nick fought a long, hard 6 month battle last year with testicular cancer at age 22. We all waited with our breath held in February for his first follow up CT Scan. When the check-up came back clean, Nick immediately booked his flight to Thailand. He was off for a well-deserved break to travel for a few months. Once he hit “buy”, we could start our travel planning and hope that we would catch up with him somewhere along our travels in SE Asia. Nick had done his research and decided to fly with Cathay Pacific. Even though he has youth on his side, at 6’3” he was not going to do this long trip on a budget airline crammed in like a tall sardine. He was very happy with his Cathay Pacific flight in economy, with decent room to stretch out with an aisle seat. We would follow his lead and book Cathay Pacific, even if this princess needed to book in Business Class! Transit through Hong Kong was easy and he even had time to grab a beer before re-boarding for the shorter hop to Bangkok. Crashing the first night at the airport hotel, he met up with a travelling friend and off they went for their first adventure. 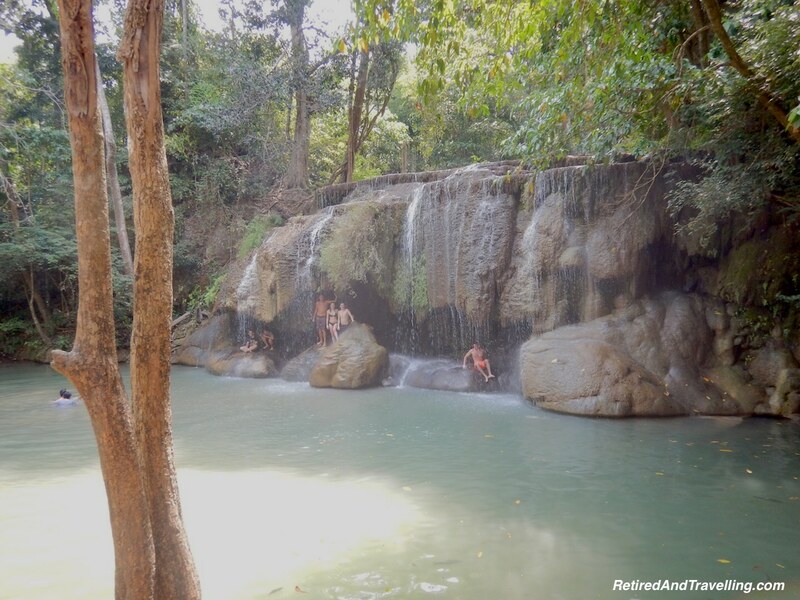 Nick’s first stop as an advance travel scout was in Kanchanaburi, located about 140 km NW from Bangkok. 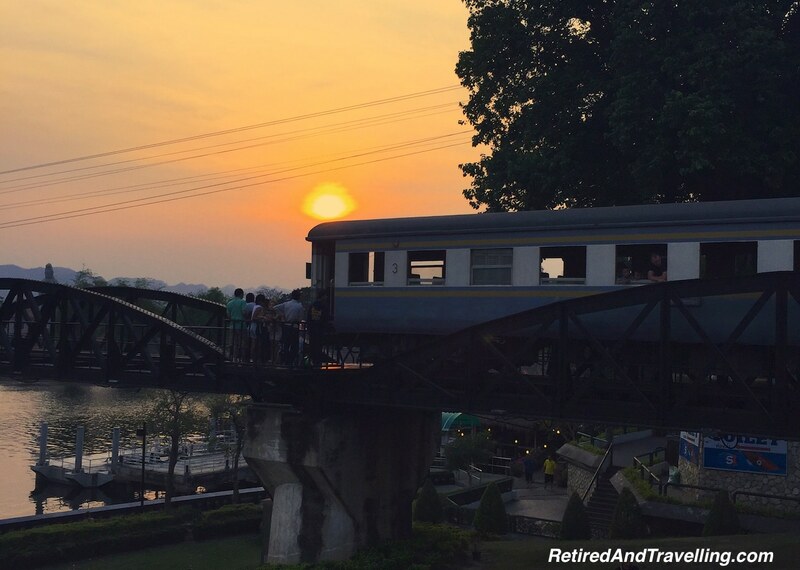 The first picture sent back was sunset on the Death Railway over the River Kwai. He really was in Thailand! The next day he rented a scooter and off they went to hike the conservation area and visit the 7 different areas of waterfalls. After 2 days, he was heading south to the island of Koh Tao. His exact text was “20 hours of bussing ahead of me 😧🔫 and a 3 hour boat ride with swells”. Our advance travel scout would try out this island paradise next. Despite his feelings about the travel, he arrived and settled in, enjoying his first night watching fire poi and fire spinning on the beach. Nick teased us by telling us that Koh Tao was a scuba diving paradise. He knew we would love it when we finally arrived! Snorkelling for a day cost just 500 baht or $20 CAD, lunch included. There were lots of places to visit by scooter. He went up to a steep incline to the high viewpoint to take in the sights – all for under $20 CAD. 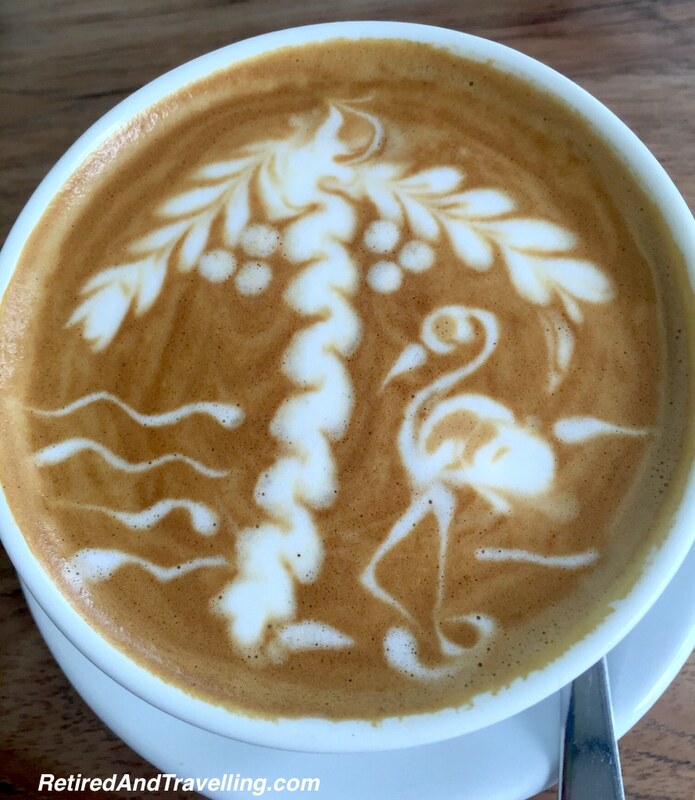 He could have his caffe latte on the beach while he waited for an omelette for breakfast as the dogs and cats that were everywhere made him smile. Nick quickly proclaimed that Koh Tao was “pretty much made for me”. He really wanted us to ensure we put Koh Tao on our travel plans. But he did not feel we really needed to spend time on Koh Samui, even though we would likely fly there to catch the ferry to Koh Tao. This had been a great stop for our advance travel scout! 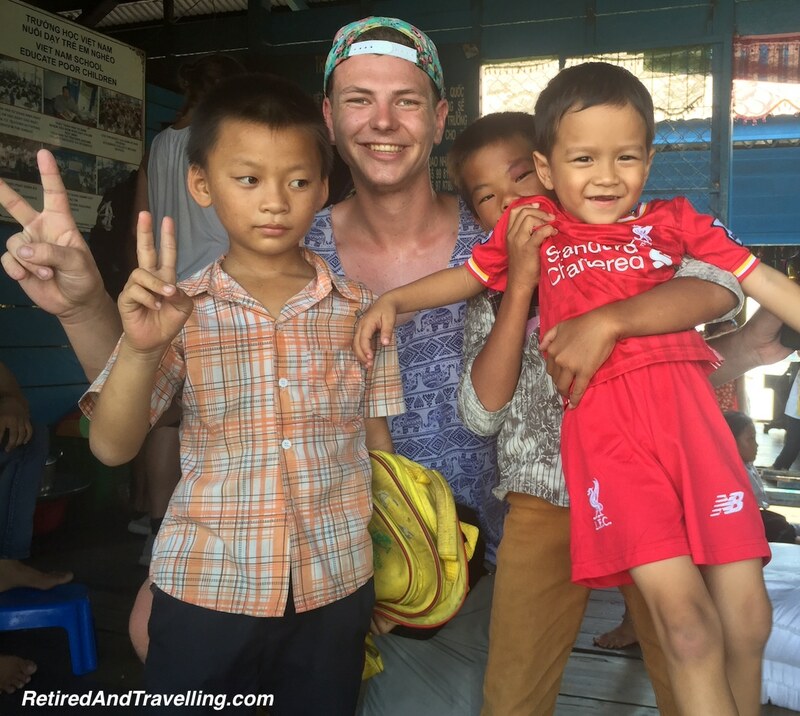 Nick had met up with a group of guys who were moving on to the island of Koh Phanyang so he decided he would join them. There was a group of about 10 – Germans, Pacific Northwest Americans, 1 swede and 1 brit. The island is known for the Half Moon Festival but Nick was not really into what turned out to be a highly commercialized EDM event that charged the equivalent of $40 CAD for one night’s entrance. In Thailand you could go for awhile on that kind of money! 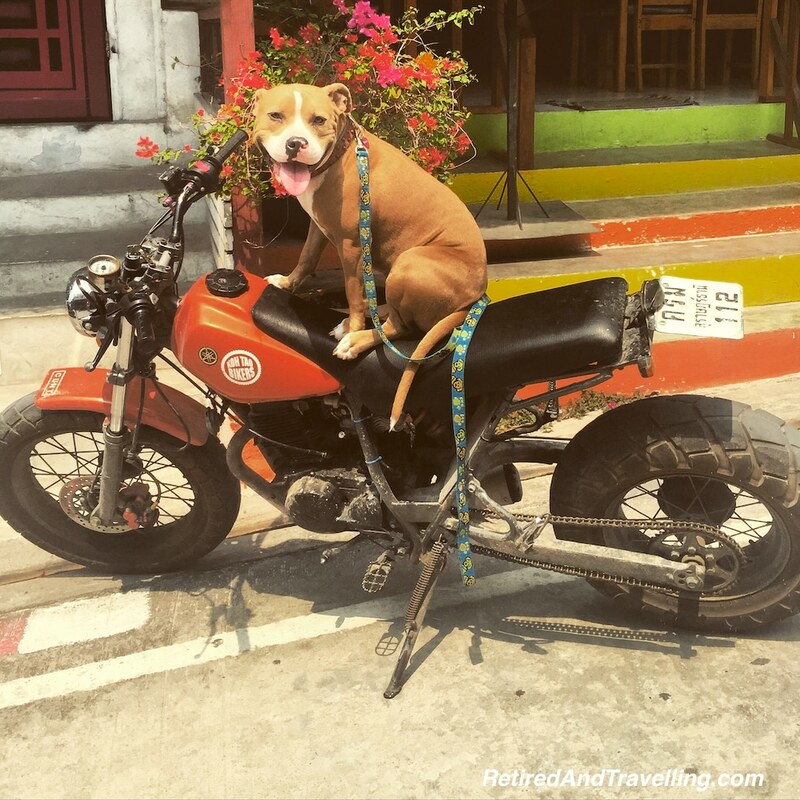 Our advance travel scout suggested that we did not need to put Koh Phanyang on our travel itinerary. After 2 days of on Koh Phanyang, including several hours exploring on a 250 cc dirt bike, Nick and his new friends from Seattle were ready to move on. It would be a long ferry – bus – bus – bus trip of about 30 hours to get to Bangkok and from there to Seam Reap in Cambodia to catch the spring equinox. The whole trip would cost only 1350 baht (about 50 CAD) and when they arrived, $13 CAD got him a shared room with wifi and air conditioning. It was even hotter in Cambodia (37°C) and keeping cool would be important. Nick has always been an adventurous eater (he didn’t get that from us!) and had no problems just wandering to the night market to get a traditional Cambodian fish curry. The next day he was invited to eat with a local family and had snakehead fish (made with a real snake’s head). I was beginning to think I might be food challenged on our coming trip! 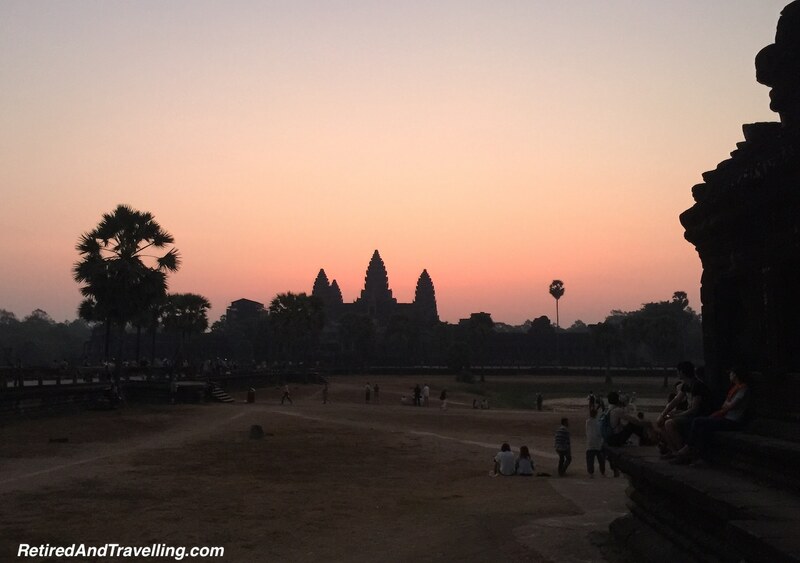 The sunrises over Angor Wat for the Spring Equinox proved to be as beautiful as they had hoped. 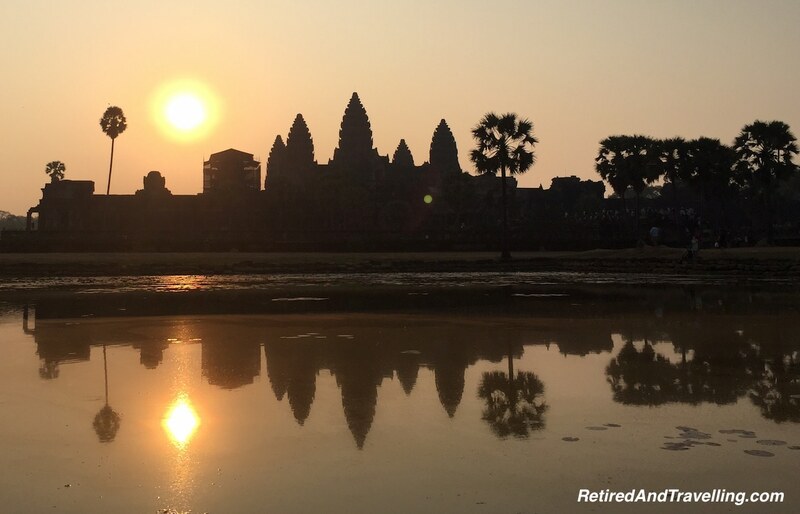 Our advance travel scout wanted us to add Cambodia to our travel plans but we would not have the time on this trip. From Cambodia Nick caught a budget flight to Bali to meet up with friends already settled in there. Nick really wanted to stay as local as possible while he was travelling. He did a mix of hostels and small local hotels – air conditioning seeming to be the one thing he really wanted in his accommodations. An upgrade from a $15 hostel to a $40 hotel in Thailand got him air conditioning, a good bed and some privacy. 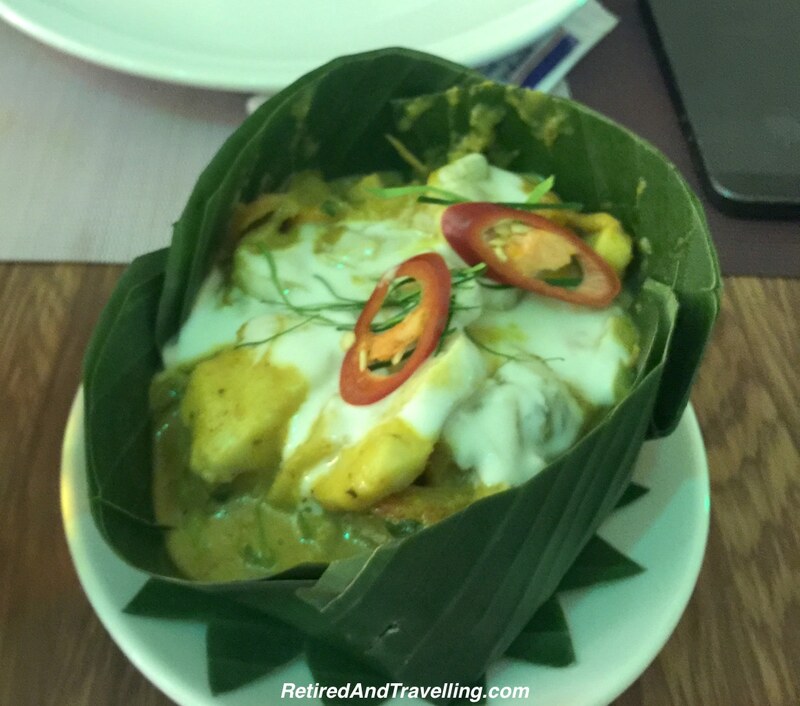 We were not sure if our advance travel scout would be picking hotels for us, but it was great to see that Thailand still offered great value for our flagging Canadian dollar! Wifi seemed to be pretty good wherever he stayed. This let me get regular updates from my advance travel scout as he moved from spot to spot and he was great about letting me know when he would be off the grid for any length of time. There was no problem hopping on a scooter when Nick wanted to explore and one time he even rented a small motorcycle when he was travelling 150km in one day. A scooter was something we would certainly do. He got advice on buying versus renting for long trips and was forewarned about the need to sometimes pay a bribe if he was stopped. He found a great tuk tuk driver in one place when he wasn’t driving himself. For longer jaunts he had no problem settling in for a 30 hour ferry – bus – bus – bus trip! Our advance travel scout warned us about the long travel times if we wanted to go from south to north Thailand but maybe he didn’t realize we would be flying! I am well past 30 hour bus trips. At 22 Nick didn’t need mommy reminders and I tried very hard to bite my lip and not offer unsolicited advice a few times after his updates. He was great about using 60 SPF sunscreen until the day he went snorkelling and got pretty badly burned. He did not need mommy advice about finding some aloe vera. On the days I knew he was driving a scooter for long transits, I was always happy to hear he had arrived safe and sound. When he headed off to the Thai island known mostly for wild partying, I kept quiet and I needn’t have worried at all. I had to gulp twice when he sent a picture of a Burmese Python snake wrapped around his neck. When our advance travel scout decided he would get not one but two tattoos using the original bamboo stick and poke method, I bit my tongue about infection. They were artistic and interesting but I would not be trying it when I arrived in Thailand. 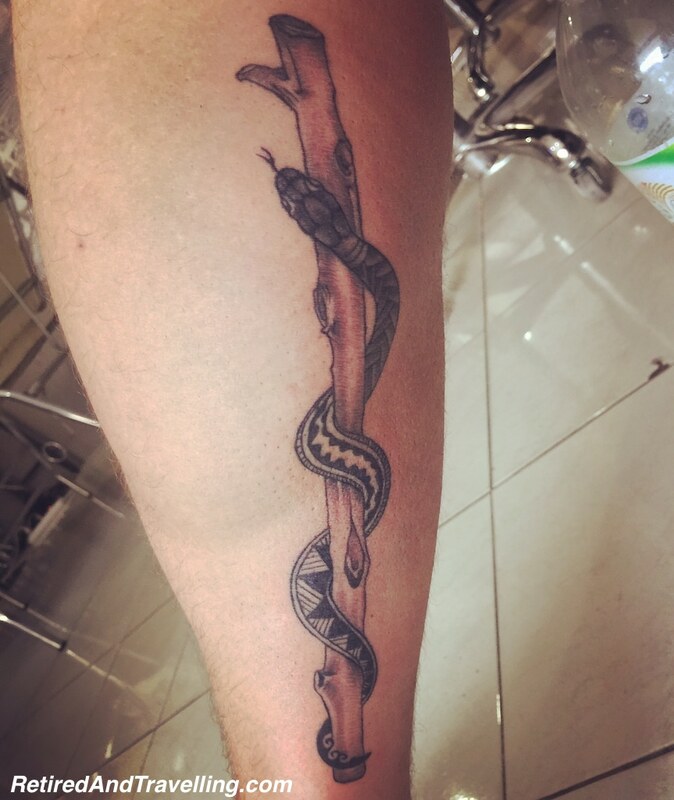 The large tattoo up the back of his calf is called the Rod of Asephilius which represents modern medicine for thousands of years. Since modern medicine had saved Nick, it was quite fitting that he show his respect. At 22 Nick is a young man who has faced life square on. His experience with cancer matured him and made him a much more thoughtful person and it has brought us closer. But while he is a young man, he will always be my “kid” and I will never stop worrying! But I will try hard to keep my advice and angst to myself! While I worried about Nick at times, he knew what it felt like to have responsibilities and others to be worried about. 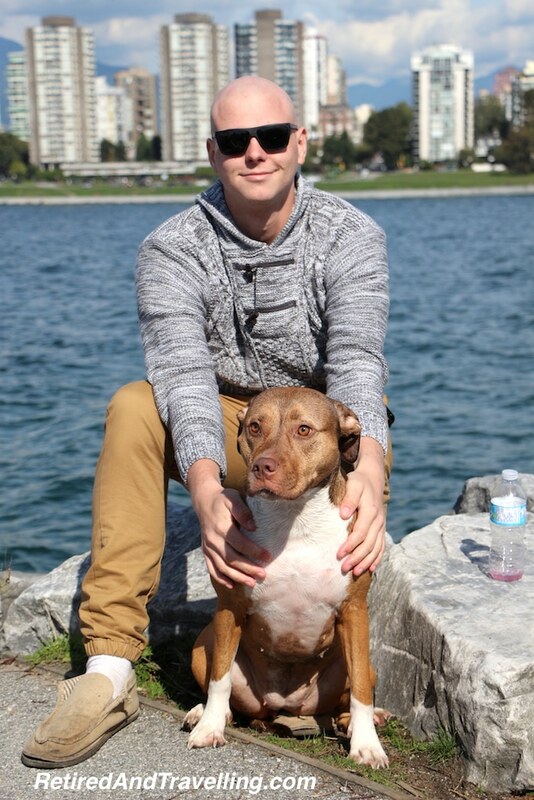 He had left his adorable pit bull Gypsy at home in Vancouver. He had to scramble at the last minute when his normal dog sitter was not able to take Gypsy. When Gypsy started to show signs of abandonment, Nick’s first reaction was that he would be cutting his trip short to go home. Luckily one of his friends went over to visit Gypsy and that settled her down. Nick is a friendly open young man with a big heart. He had no trouble making friends as he travelled around. While he met other travellers that he hung out with and even travelled with, it was the locals that he often spent time with. 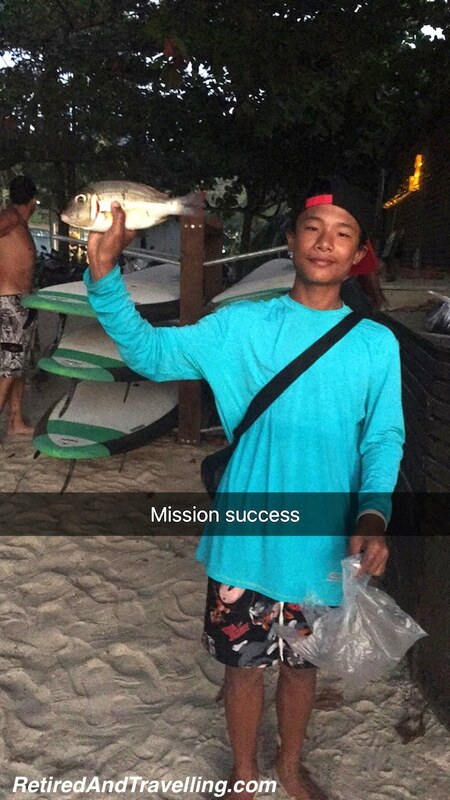 In Koh Tao, he went fishing from a kayak with one of the local kids named Lay. He was excited when Lay said they may even get to try spear fishing. When Lay brought him dried butterflies one day as a snack, not wanting to be disrespectful of local customs, Nick tried them and proclaimed them to be “pretty yummy”. Even after Nick left Koh Tao, Lay continued to keep in touch with Nick through regular voice messages (since his English was not great for writing). 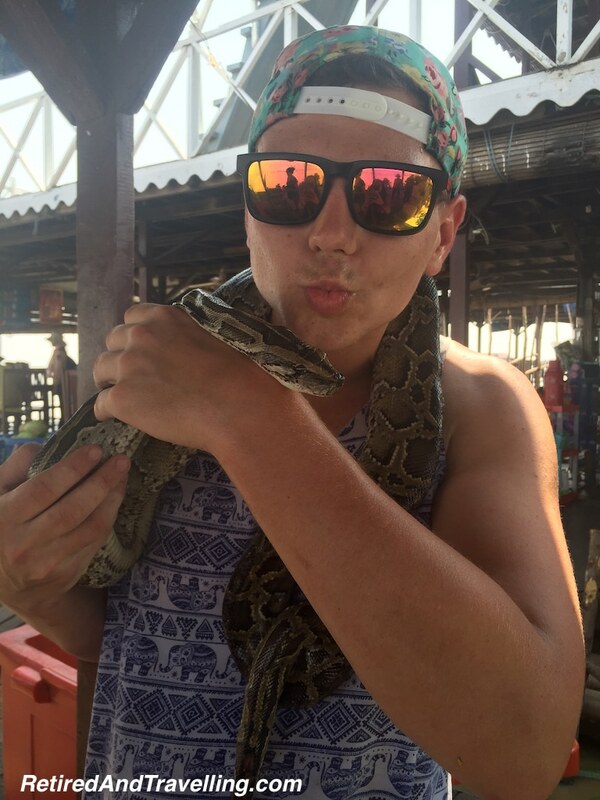 Nick was looking forward to our meeting Lay when we visited Koh Tao. 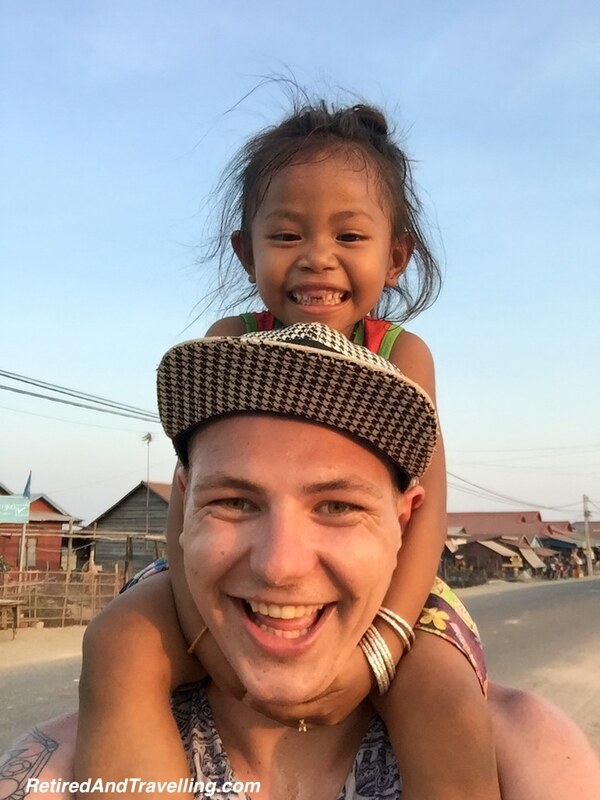 When Nick was in Seam Reap, I had to smile when I got my daily update and it read “I quite possibly just had the best day of my life … the most magical experience I’ve ever had”. Nick went to the floating market on the lake In Cambodia with his tuk tuk driver Tom. They went to the orphanage and brought them rice and played with the children. Afterwards Tom took them to his local village and his mother’s house to play with the kids and share dinner with them. He had a ball lifting the kids like airplanes and flipping them around. I am sure he was a big hit when he agreed to wear the Burmese Python snake around his shoulders! He wrote it was “pure happiness” to share his day with Tom and his family. It touched him deeply that the poorest of people could find so much pleasure from so little. With each passing day of travel, our advance travel scout was learning to value and respect the locals and their traditions. 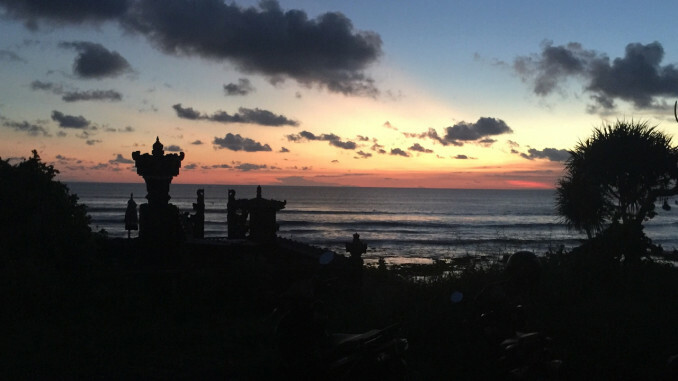 Nick is currently in Bali, acting as our advance travel scout once again. He is staying with a group of friends from Vancouver in a villa in Canggu (on the western coast). We hope he will still be there in a few weeks when we finally hit Bali after Australia. While we may be staying less local than him when we arrive in Bali, we will be looking for great tips on day trips and other things for us to really enjoy some of the spots off the beaten path. We know Nick will find them! It was great to have an advance travel scout in Thailand. It whetted our appetite to leave when we were still in Toronto putting up with the last winter storms. As Nick moved through some of our travel destinations, we got more and more excited to start our trip. We sure hope we can synch our schedules as we travel to Australia, Bali and Thailand and catch up with him! Who has been your advance travel scout? Did you get good travel advice? Are you laying the path for someone else?